Ludwig was born as second oldest Leitner on February 24th, 1940 in Mittelberg after his brother Reinhard. His younger brother Adalberd, who is living in Kanda nowadays, completed the team. With more than little means, but the more love, "Agathle" (as a single mum) managed to raise those three sportive and always hungry boys. Luggi, as he was called later, never met his father Reinhard, since he had died 1943 in war. Even as a young child Ludwig was fascinated with skiing. He'd have fun at the backyard hump with his brothers day after day. Tirelessly they rode down and went up back afoot until the sun got down. When in 1948 the "Zafernalift" started business, Ludwig was one of the first to use the new ski-lift and soon after that the locals took notice of his huge talent. After finishen school he started an apprenticeship as a tradesman in the Ski-compandy "Sohler" in Wangen. During the winter months he was released from work to go racing. Whenever he had the time to, he spent his summermonths on the alp "Zügen" near Baad. Only 17, Ludwig caused a stir, when finishing the world champion ship in ski-running as 6th. The start of a great carreer. Casually the young man did have other interests as well, and so he got known to his neighbor Renate (Fritz) better in the legendary Pub Alpenrose. The ambitous guy always kept a level head and still attended to his hobby - by now his job as well - the alpine skiing. 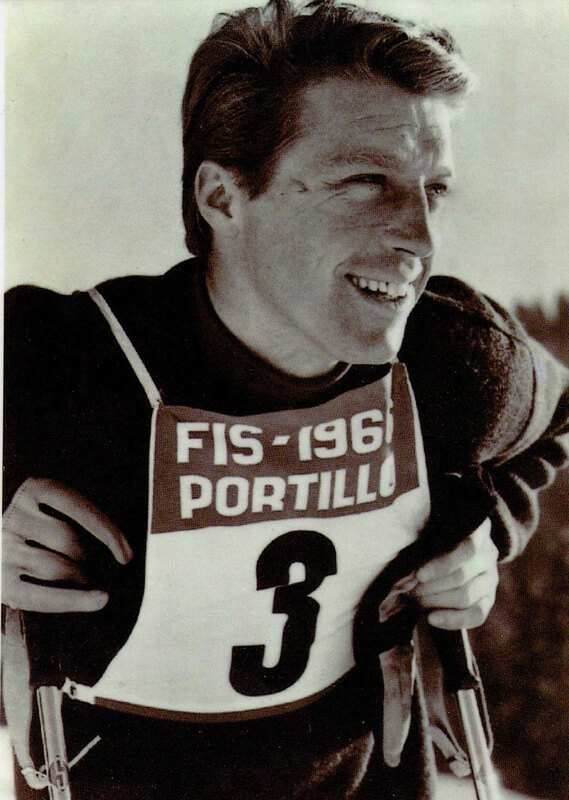 Luggi has won all the considerable FIS A races (nowadays weltcup) and topped his success (besides two bronze meddals) with the title of world champion in the alpine combination 1964 at the olympics in Innsbruck. After this dream had come true one could hear the wedding bells of St. Jodok in Mittelberg on November 21st 1965. The same year the newly-weds built the Hotel Luggi Leitner with a public restaurant. Renate noticed quite fast, that her Ludwig showed much more talend on skis than as a bartender. To write bills was not what the was best at, as well. Friends and acquantaince were mostly invited. His generous heart, as well as his modesty are known until today. Luggi ended his carreer in the winter of 1968 after the olympic games of Grenoble with only 28 years. From now on he attended himself to the hotel and most of all to his family, which was blessed with his daughter Sandra on May 1st. When his "son and heir" Michael was born in fall of 1972 it was time to close the public restaurant. Besides his actions in family and home, Ludwigs growing enthusiam belonged to wood-working. More and more mashines were purchased, until the garage looked like a carpenters shop. Friends and everyone who came to see him were still welcome as to have a break with a beer and a cigarette. His generosity did not know any bounds and he could hardly say "no". For this reason it happend now and then, that the best mashines were away for weeks and months although he would need them at home desperately. After all, most of the hotels and guest-rooms furnishing were built by the world champion himself. Even a long time after his career he was still known to lots of people. Whenever asked, he would give interviews and tell storys for comercials on radio and tv or be a double for James Bond in "On her majestys service". Starting 2012 health problems started to appear, which Ludwig did ignore stubbornly at the beginning, but which made more and more trouble until the trip to the doctor was unavoidable. From beginning of 2013 on, his health vanished rapidly. After a short hospital stay at the beginning of March he started into his last race on Thursday, March 21st. 2013. He reached the finnishing line at 5 p.m. on gods will. Ludwig loved his family, his life, his home-valley and quite especially - his Mittelberg.